We can use a Wheatstone bridge to measure an unknown resistance. But for doing so for an ionic solution presents two challenges. First problem is the change in composition of solution when direct current passes (DC) through the solution. Second problem is that we cannot connect an ionic solution to the bridge the way we connect a metallic conductor. The first problem is solved by using an alternating current (AC) source of power. The second problem is solved by using a specially designed vessel which is called conductivity cell. A conductivity cell is composed of two platinum electrodes which are coated with platinum black. 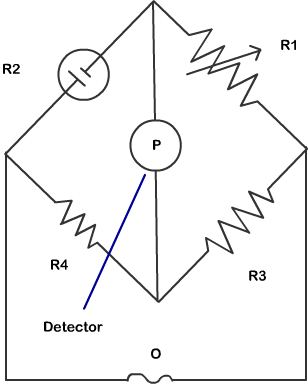 The electrodes have area of cross section equal to A and are separated by distance ‘l’. Hence, the solution confined between the two electrodes is a column of length l and area of cross section A. The resistance for this column of solution is given by following equation. The quantity `l/A` is called cell constant and is denoted by the symbol G*. Using the values of cell constant and resistance of solution in the cell, we can find the conductivity of the solution by using following equation. Molar Conductivity: Molar conductivity is the conductivity of the solution divided by molar concentration of the solution. It is given by following equation. Conductivity always decreases with decrease in concentration of both, weak and strong electrolytes. This happens because the number of ions per unit volume decreases on dilution.